July 6th 1890 in Goldenhill St John's. See the census records for Samuel and George Pimblett 1841 to 1891. Click the above link for Annies Family Tree. Annie Pimblott was the daughter of George Pimblott and Sarah. She married William Henry Caton in St John's church in Goldenhill in 1890. They lived all of their lives in Goldenhill. For the most part at number 40 Taylor Street. 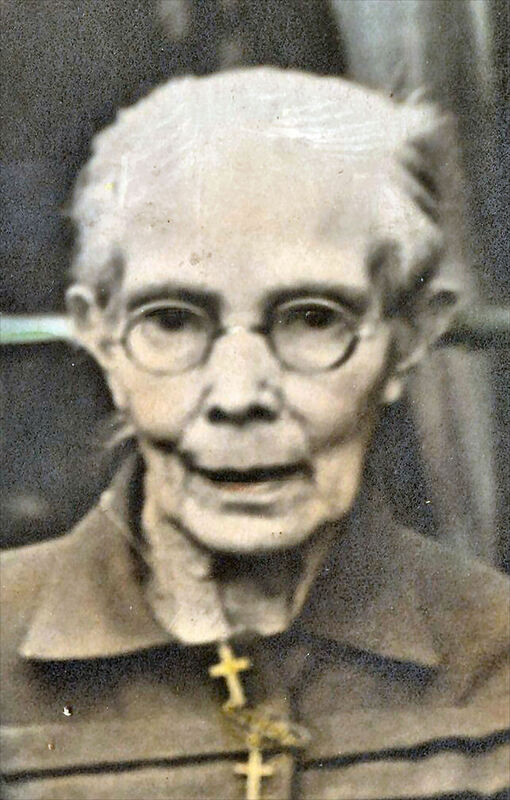 Annie Pimblott was born in 1869 and she was the daughter of George Pimblett a coal miner from Goldenhill, who was born in 1830 and married a young woman named Sarah Nixon, in the 1881 census records the Pimblett family of three children and two grand daughters Lizzie Pimblett aged seven and Martha Pimblett aged four were living at 24 New Street Oldcott (Goldenhill). David was a widower so the two grand daughters, Lizzie and Martha must have been David's. Extracts from the 1881 Census Records. Census Records Dwelling:- 24 New Street Oldcott. Staffordshire. Note on the 1881 Census records the original spelling of Annie's surname name was PIMBLETT. Census Records 1891 Dwelling : New Street, Goldenhill. Census Records 1901 Dwelling: 10 Queen Street, Goldenhill. Census Records 1911 Dwelling : 44 Taylor Street, Goldenhill. The 1911 census returns also show that William and Annie had been married for 20 years and had a total of 12 children of which 5 were still alive and 7 had died. Sarah Ann the last born and thirteenth child must have been born after the 1911 census. William and Annie's thirteen children. Eliza Caton born in Goldenhill 1890. Died one year later in 1891. Rupert Caton born in Goldenhill 26 August 1891 and died in the same year 1891. Levi Caton born in Goldenhill 6 Mar 1894 died 15 Jan1955. Married Clara Dale in 1917 at Longton St John the Baptist Church. They had five children. Edna May, Ada, Levi, Mavis,Derek Caton . Leonard Caton born in Goldenhill 15 January 1894 and died in the Birchenwood pit disaster 18 Dec 1925. Married Elizabeth Brindley. They had three children: Grace, Fanny and Gladys Caton. George William Caton born in Goldenhill 5 July 1895 and died in 1967. Married a woman named Sarah Ellen Heath in Tunstall methodist church in 1921 and they had a child named George . Timothy Caton born in Goldenhill 4 January 1898 and died less than a year later in 1898. Thomas Caton born in Goldenhill 9 March 1903 and died the same year. Thomas and Jacob were twins. Jacob Caton born in Goldenhill 9 March 1903 and died the same year. Jacob and Thomas were twins. Gladys Caton born in Goldenhill 6 May 1905. Married Daniel Colclough at Goldenhill St James in 1936 and had three children: Beryl , Edna and Daniel Colclough . William Henry Caton born in Goldenhill 1 February 1907 died the same year. Lilly Caton born in Goldenhill 24 March 1908 died in 1999. Edward Caton born in Goldenhill in 1910 died the same year. Sara Ann Caton born in Goldenhill in 1911 died 1960. Married George Colclough at Goldenhill St James in 1936. They had two children: Irene and Alma Colclough.